Many people who aren’t that familiar with online bingo for real money think that winning is merely a case of luck rather than skill. While there’s an element of truth in that, due to the fact that the balls are ‘called’ using a random number generator and, therefore, no-one knows which player will win which game in advance, there are certain skills – or tips, shall we say – that can be employed to improve your chances at winning in online bingo. Win $7 Free – Share your favorite tips in the comment box below on & receive $7 lucky charm bonus credited to your BingoMania account. 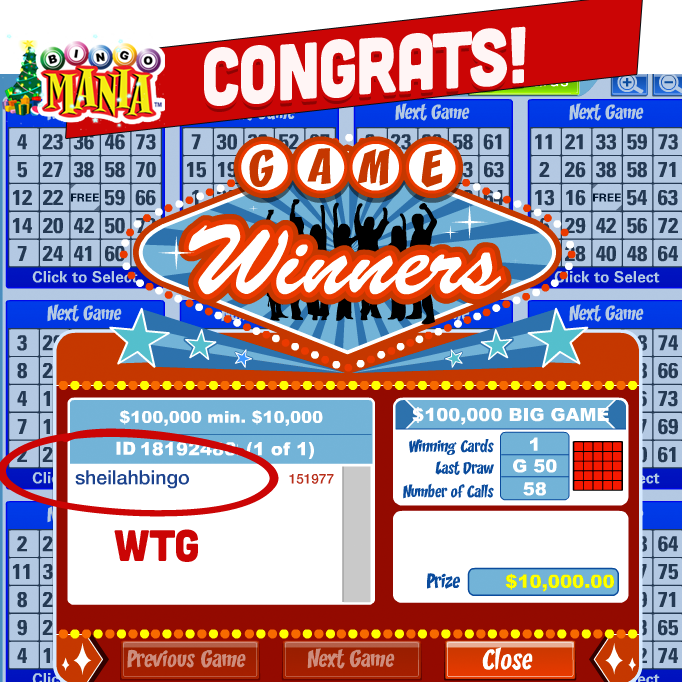 Screenshot of the recent BingoMaia $10,000 Bingo Game Winner on Dec 25th 2013! Many of them are extremely simple to employ and, while we can’t guarantee that any of them will secure you a win, they may well prove to shift the odds in your favor and it’s certainly worth seeing if they work for you. Not every online bingo site offers the auto-daub option, but most do. You’ll more often than not find it under a ‘settings’ button once you’re inside a room and you’ve purchased cards for a game. Some traditionalists like the feel of land-based bingo and, therefore, prefer to mark their cards themselves. However, the auto-daub option is there for a reason and if you’re new to the game or you’ve bought more cards than you can physically keep your eyes on without going giddy, it’s an easy and foolproof way to ensure that you don’t miss marking off any balls on your card. Fortunately, at Bingo Mania, even if you have auto-daub off, and you had the winning bingo card, you’ll be rewarded with the win. So be sure to look for bingo sites that offer you auto-win even if you do not have auto-daub turned on. Imagine how cross you’d be if you realized you’d missed out on a Bingo win because of one number you didn’t see on your card! This single, nifty feature does all the hard work for you, as does the auto-shuffle feature which sorts your cards into order depending on how many numbers remain to be dabbed before you can claim a win. Auto-daub will mark off every single number on every single card you’ve bought, and it will do this simultaneously if a certain number appears on more than one card. It’s not only the safest way to play, but it will also free up your time to chat with your fellow roomies and even play side-games if you so wish. Some of the most popular sites get busy – it’s a fact of life – and the more roomies there are, the more people will be vying for a limited amount of prizes. However ‘nice’ your fellow players may be, they’re still your competitors at the end of the day and, unlike a sports competition where you’ll have the upper hand if you’re the superior athlete, you can’t really train to be a ‘better’ online bingo player than anyone else. So, unless you want to join a less popular and less busy site (and if you do, don’t forget to check it’s got great player reviews, and is properly licensed and regulated before you register), how do you go about increasing your chances of winning? Firstly, most online bingo lobbies will show you how many players are currently in a room, how many tickets have been sold, and what prize money you’ll be playing for. If at all possible, pick a room that’s got less people in it, as so long as there’s a reasonable amount of prize money up for grabs, you’ll stand a better chance of winning if there are fewer people playing. Time of day is a major factor too as players tend to jump online at certain peak times and crowd the rooms, such as mid-morning, lunchtime, early evening, and after their evening meal. Tip: Did you know you can win huge prizes late night at BingoMania inside the Naughty & Nice room as well as the fun-filled Pajama Party? These rooms tend to have less players than average giving you a great chance at winning some exciting prizes. We’re not suggesting that you go without sleep or totally reschedule your day around online bingo, but it certainly helps if you can play at less busy times of the day when there are fewer people in the rooms. Typically, quieter times include midnight through till 6am, as well as 8.30-9am and 4.30-5pm when many people are heading to and from work or doing the school run. We know that how many cards you purchase for each game depends on your budget and the price of the cards. However, it stands to reason that someone holding 30 cards stands a better chance of winning a prize than someone else who’s only purchased one. Many online bingo players would say that, if you can afford to, you should always buy the maximum allowable number of tickets in order to increase your chances of winning. Tip: at BingoMania, you get a minimum 100% and up to 300% daily bonus on your deposits on special days up to 400%. Instead of depositing $20 at a time, deposit a higher amount to reap more free bonuses, giving you longer playtime & playing power to win those juicy prizes. If you are on a budget look out for special games where all players have to purchase the same amount of cards – these games are fair to all players, so those that usually max out can’t have an unfair advantage by purchasing more tickets than you. Inside the Loony Bin Room – you’ll find hourly Fair n’ Square games. Plus, with new Pack & Line Room, we’ve set the max card as low as 12 cards, evening out the playing field and reducing the chance of a few high rollers over purchasing vs the rest of the players. Another way you can help increase the odds of your winning a game is by joining online bingo sites which offer generous bonuses (welcome bonuses and re-deposit bonuses are always good), BOGOF card deals, Happy Hour card prices, and other incentives that will help you play more games for little to no money. The more you play, the more regularly you ought to win. 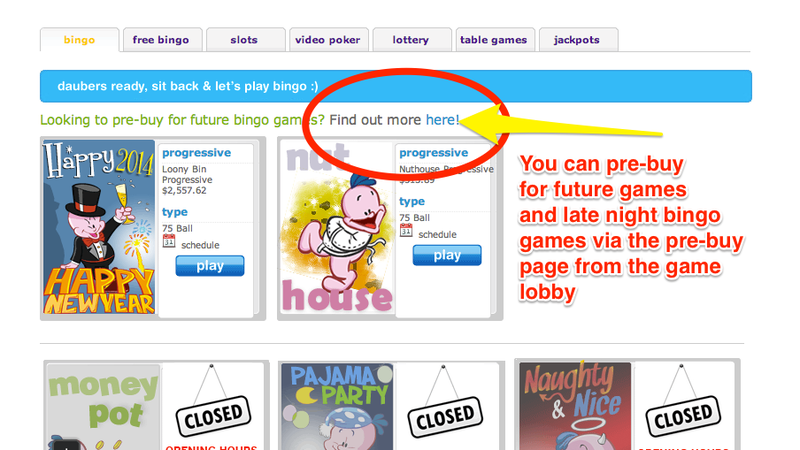 TIP – Check those T’s & C’s though for any special play through requirements from other bingo sites. Fortunately at BingoMania, long ago we opted to never ever force our players to go through a wager bonus requirement on their free bonus. Other sites like our competitors always force you to wager you bonuses several times before being eligible to cash out your winnings. Most online bingo players are a friendly bunch, and if you get particularly chatty with a few of the roomies at your chosen site, they’re not likely to mind giving you a few pointers if you ask them nicely. You could also join an online bingo forum to discuss ‘tactics’ with other players. If you choose to do this, make sure it’s not all one-sided; be prepared to share and discuss your own formulas for winning. TIP – take full advantage of the chat room. There are often bonuses available to the friendliest roomy or special chat games and sometimes random spot gifts given by the CH. You’ll find great chat games inside all of the BingoMania rooms, where you can win and grab a few free bonuses alongside your bingo game. We hope that some of these tips have shown you that it can be possible to improve your chances at winning bingo online for real cash prizes. However, don’t rely on these ideas alone. After you’ve been playing for a while, you’re likely to realise what seems to work for you and what doesn’t. Plus, if winning becomes so important that you lose sight of what online bingo’s really all about – social play, banter, relaxation, and fun – then you should reconsider playing. If you’d like to test out a few of our tips or even some of your own, it’s well worth making use of free and penny games/rooms at your favourite online bingo site to do so. We want to give you $7 free for simply sharing your favorite bingo winning strategy or tips. Simply use the comment box below & you’ll receive a $7 free credit in your BingoMania account. Please allow up to 24 hrs for your credit to be added. Thanks!